1. Collect an assortment of rocks. 2. Clean with soap and water, then paint with fall colored acrylic paints (It’s not necessary to cover the entire rock with paint, leave some areas exposed if you wish. Let dry. 3. Print words of wisdom or Thanksgiving quotes on paper. Tear out the sayings (ragged edges). 4. Glue the sayings to your rocks using either white glue or Modge Podge. 5. Finish off the rocks by applying low-gloss varnish or polyurethane. At home a variety of rocks good be arranged for centerpiece or in a cornucopia along with some other dried elements, such as nuts or grasses. After Thanksgiving this makes a nice paper weight or addition to a garden! Gather colored paper (red, orange, brown, green, yellow) Trace the children’s hands onto several sheets of several colors. Cut out. Then cut out a brown tree trunk branches in proportion to the amount of leaves. Have the children glue the hand shapes to the tree trunk to form the leaves of the tree. Have the child think of things to be thankful for and label the hand/leaves. is a sample from Mann School Art Appreciation. Children can make a beautiful wreath of leaves that displays what they are thankful for. This wreath makes a great Autumn or Thanksgiving decoration. Cut a HALF CIRCLE OUT OF THE CENTER of a plain paper plate. Cut out a lot of leaves from construction paper. Draw the leaf veins if you wish. If you’d like, use a leaf template. In the lower center of the wreath, (the half circle part that was NOT cut out) write, “I am thankful for,” and then have the children write or draw what they are thankful for. Put the child’s name on the wreath (or let them sign it). For variations on this wreath: instead of using leaves, use cut-out handprints of the child, tissue paper baking cups or torn-up scraps of paper. Give kids multi-colored paper feathers (made from construction paper) and have them write something nice about other students or family members. 1. Cut out construction paper feathers. 2. Put a small blob of clay on one side of the pine cone to steady it on the table. The pine cone will be the turkey’s body. 3. Glue the “feathers” to the top of the wide side of the pine cone. Glue the acorn to the front of the turkey using hot glue. Glue on two googly eyes and a small piece of red construction paper (for the turkey’s wattle). Let the glue set. You now have a great Thanksgiving table turkey decoration. To avoid staining a tablecloth with the clay, put the turkey on a small plate. 1. Do you have a large pattern or coloring book picture of a cornucopia. If so, make a copy for each child. 2. Have kids color the picture. 3. With stick glue, apply glue to a piece of fruit in the cornucopia; sprinkle dry jell-o (matching the fruit) over the glue. Shake off excess jell-o powder. 4. Reat with the other fruit and flavors of jell-o. I painted the kids fingers different (Turkey) colors and placed them on a piece of tag board. Then I painted one foot. Place foot opposite way so the heel is on the top, your toes are the turkey feet and your heel is the head. The funny part is I told all the kids is they had to scrub their feet the night before. They didn’t know why and their parents were questioning. I told them it is for a gift for them. We wrapped them up and gave it to the parents for Thanksgiving. Some are framed and hanging in homes every Thanksgiving. I didn’t have a poem including the feet but that would be adorable. Which are part of me. Materials: Construction paper or tag board, glue, paintbrush, different seasonal spices such as: nutmeg, cinnamon, cloves, allspice, whatever smells good! 1. Trace children’s hands on tag board or construction paper. Have the children then put glue on the palm and finger shapes. 3. To make the spiced handprint become a turkey, draw-feet, eyes, beak and wattle. TURKEY: (Sample and Photo by KidActivities) Need: apples, ingredients for feathers, candy corn, large marshmallows and colored toothpicks. Add colored mini-marshmallows or gum drops to 5 or 6 toothpicks; stick them in one end of the apple. Use a marshmallow for a head -tiny raisin pieces for the eyes – a cut up cany corn for the beak. Use 3 toothpicks for legs (in a triangular position so your turkey can stand up) If you decide not to add legs, cut a small slice from the bottom of the apple to sit straight. Personally, I like to then eat the spice gum-drops! When you are making food crafts with children, make sure to have a few extra pieces for the kids to munch on! 10. PLYMOUTH ROCK SEATING–A fun alternative to place cards! 1. Make sure rocks are clean and dry. 2. Paint the stone/rock entirely or with designs on it. 3. After the rocks are dry, paint names of Thanksgiving Day dinner guests! Coat stones in brightly colored craft paint. When paint is dry, glue on pasta letters. Tissue leaves in autumn colors. Plenty of small pieces of paper (approx. 3″ X 4″ size). 2. Glue one autumn leaf to the center of each bag at an angle. 3. Tie raffia into little bows, and glue one to the base of each leaf with a hot glue gun. Write the name of each child on the bags with the green paint pen. Place small pieces of paper in a basket along with pens and markers. Have each child write a note or draw a picture (little ones) of why they are thankful for each person. If your group is having a party-this can be done in the days preceding the party. Drop notes into bags. Allow time during the party or program for the children to read their notes. A great self-esteem building activity!!! Leaves (these can be commercial silks, plastic leaves, or children can children trace and cut out their own leaves. 1. Fill the container with rocks. Remove leaves and unnecessary branches from the tree. Put branch in container. Make sure that the branch is securely anchored by the rocks. 2. Use the needle and thread to make individual hangers for the leaves. 3. Have children cut out or draw images of things for which they are thankful or have them write a list of things they are thankful for and cut out the words. 4. Use the tape to stick the thanksgiving items to the leaves. Hint: Any adhesive would work but if you use a low tack adhesive you can use the leaves again next year. 5. Hang the leaves on the tree. such as Happy Thanksgiving, Happy Autumn, Give Thanks, etc. Glue turkey head on to T-paper tube. Staple the tube to the plate. Gather brightly colored leaves and create this cute turkey! 1. Glue the leaves to a piece of construction paper. It should resemble the tail feather of a turkey. 2. Add a body cut from another piece of construction paper. 3. Add a beak, feet, and some eyes–either wiggly eyes orpaper. Tip: You may want to preserve the leaves before starting project. Thank you to MomentsofMommyHoodfor idea and images! Be sure to check out Ideas in the Autumn/Fall Centerpieces and Decorating Category! 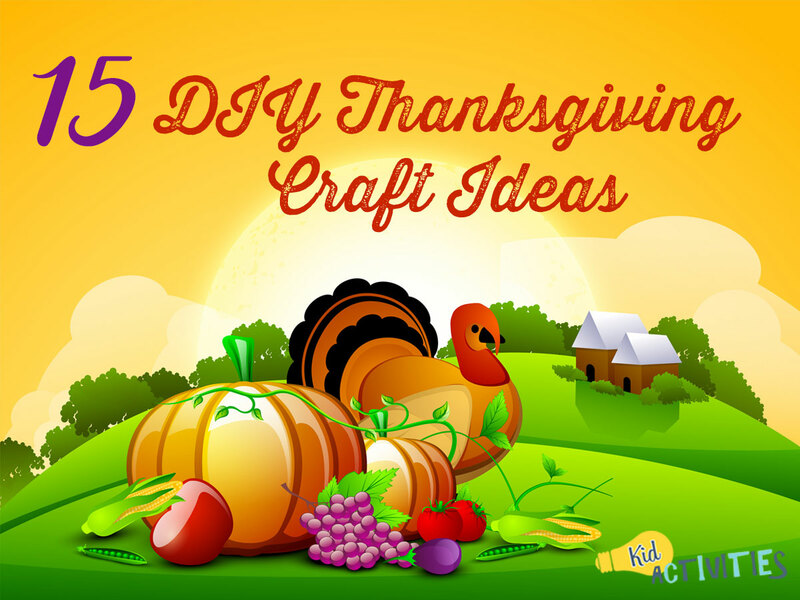 There you have it, 15 DIY Thanksgiving craft ideas for kids in the classroom.